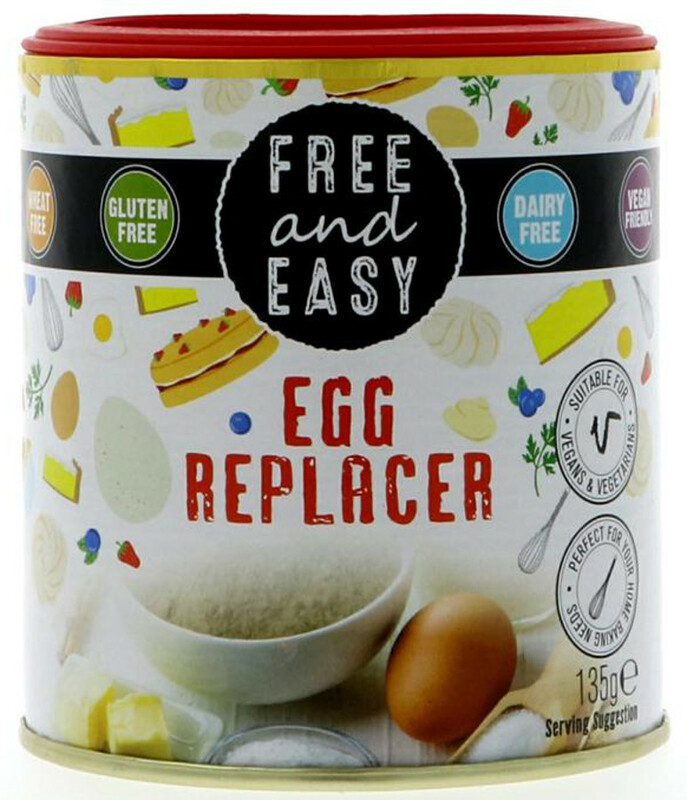 It's easier than ever to create a delicious vegan cake with this gluten free egg replacer from Free & Easy. It can be used in all kinds of home baking – cakes, meringues and pancakes for example – and is low in fat and free from preservatives. Made in the UK and free from gluten, wheat, dairy, soya and nuts. Nutritional information per 100g: Energy 128kj/3030kcal, Fat 0.1g of which saturates 0.1g, Carbohydrates 8.3g of which sugars 0.1g, fibre 2.6g, Protein 0.1g, Salt 0.01g. For 1 whole egg: Mix 1 teaspoon (3g)* egg replacer with 2 tablespoons (30ml) water. For 1 egg white: Mix 1 teaspoon (3g)* egg replacer with 1 tablespoon (15ml) water. For 1 egg yolk: Mix 1 teaspoon (3g)* egg replacer with half a tablespoon (7.5ml) water. *2 teaspoons (6g) may produce better results in some recipes. One tub contains the equivalent of 45 eggs. 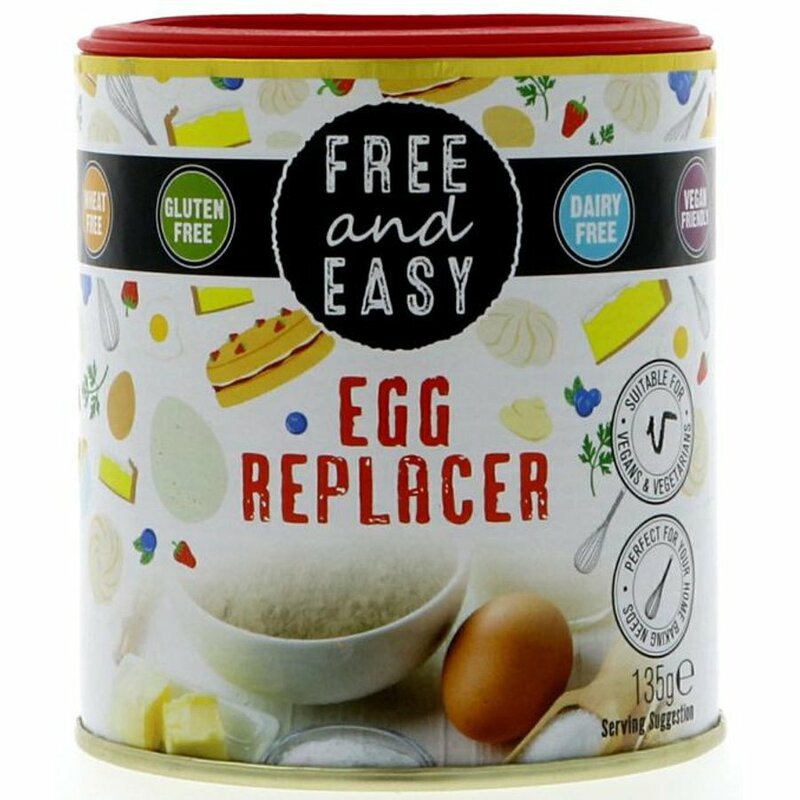 The Free & Easy Egg Replacer - 135g product ethics are indicated below. To learn more about these product ethics and to see related products, follow the links below. Bought for a vegan friend and she loves it! There are currently no questions to display about Free & Easy Egg Replacer - 135g. Free & Easy produces a range of organic soups, sauces, readymeals, pastes, gravies and drinks suitable for everyone. Free & Easy food products are free from all allergies, including gluten, dairy and nuts while also being low in fat but keeping a great taste. Free & Easy provides vegans, vegetarians, and people with serious allergies with a nutritious diet as its products are packed full of vegetables without any harmful additives.